I love compost. I do. It’s rich, dark, earthy-smelling and gives me a sense of being part of the cycle of life. It’s a great addition to the garden beds, but it’s also, often, another inadvertent growing medium – as it was for us this summer. 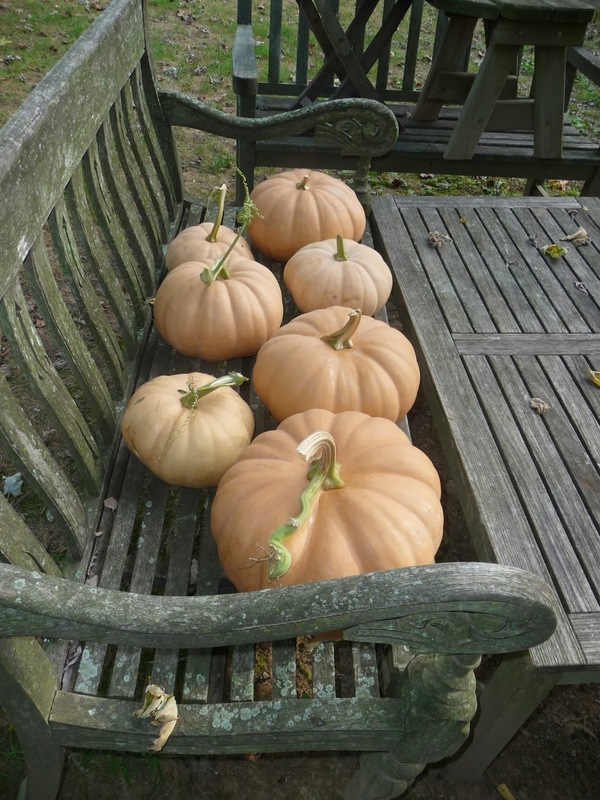 Last fall, I bought two Long Island Cheese pumpkins (Curcurbita moschata) aka Cinderella pumpkins. They are good keepers, especially if you manage to keep them in a steadily cool place – not quite as good as those rock-hard Blue Hubbards, which I’ve had last nearly nine months and still going strong when I finally took a hatchet to them to cook. Even so, cheese pumpkins in a cool place are usually good keepers — they not only last, but retain a big percentage of their glorious nutrients for months. I made pumpkin butter out of one of the two cheese pumpkins in December last year and gave some to Dave, who gave me his aunt’s recipe. The other pumpkin, which stayed on a shelf in the cool porch just outside the kitchen, I enjoyed just looking at each time I came in. It was beautiful, smooth-skinned, a lovely peachy orange, and shaped like Cinderella’s coach. Decorative. The day I planned to cook it though, I went to pick it up and discovered it had been quietly decomposing from the bottom up. Ick. I slid it onto a cookie sheet, walked it out to the compost heap on one side of the yard, laid it down gently and forgot about it. Until about June, when I noticed that a few squash plants had started themselves there. 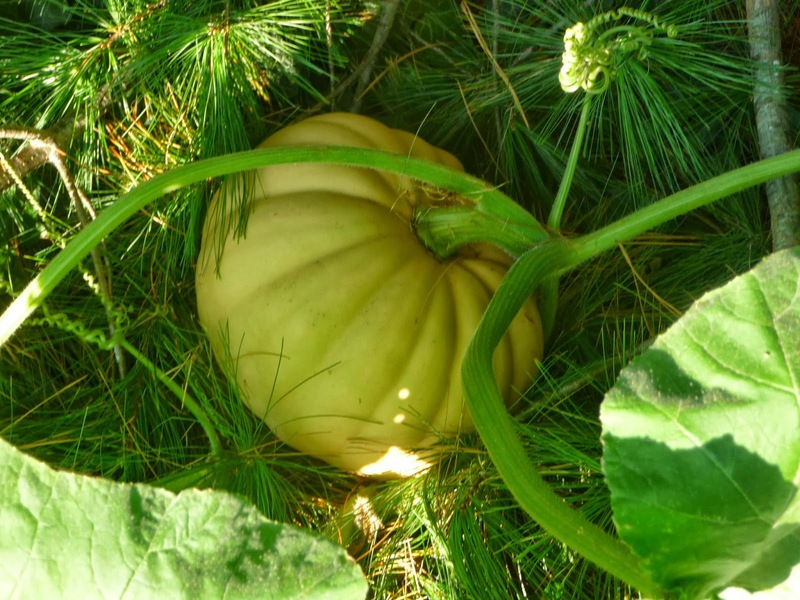 I was hoping the vines would turn out to be an Iranian squash and maybe a long-necked pumpkin, both of which I had grown the year before from seed I had saved from those varieties I had bought from a farmer the year before that. But whatever. I let the plants go; the vines got mowed around – the mower having to take a wider and wider swathe as they spread out into our yard and into the corn field on the other side of the fence – and I watched as the blossoms started along who knows how many plants. In August, we began to see the fruits. No Iranian squash, which are great, by the way, sweet, flavorful, long keepers, or long-necked pumpkins, which are like giant butternuts, but there were cute little cheese pumpkins dotted here and there among the leaves, some hidden, some proudly showing. Lovely. When we really began to look toward harvest, we discovered the largest one wrapped around a corn stalk in the field beyond our fence. I called Andy, the farmer whose corn it was, to find out when he was combining, (that’s COMbining) and that set the September 20 harvest date for that one. So far, I’ve cut nine cheese pumpkins of various sizes, given two away, and have got a bunch of little guys still growing. Fun. And delicious. Soup – curried, or spiced with tomatoes and poblanos, or pumpkin vegetable with garbanzos and smoked paprika and cilantro — pie, muffins, pumpkin spice cake, and of course, pumpkin butter. Cut one cheese pumpkin in half, scoop out the seeds (and save them to plant next year), and roast the halves on a cookie sheet at 350F until you can easily scoop out the flesh (about 40 minutes, depending on the size of the squash). Let cool enough to handle, scoop out flesh and add with the other ingredients to an enameled iron pot (which distributes the heat evenly and is easier to keep the pumpkin butter from sticking, but a stainless pot will do just as well if you stand there and watch it). Cook on medium-low heat, stirring frequently about 15-20 minutes until all ingredients are incorporated and the butter is smooth. (You may need to run a hand blender through it to get it smooth). Jar it and refrigerate. If you put this in a sterilized jar with a sterilized lid and refrigerate it, the lid will probably draw and will keep the butter happily usable for months. Otherwise, you’re probably looking at a week, maybe two. 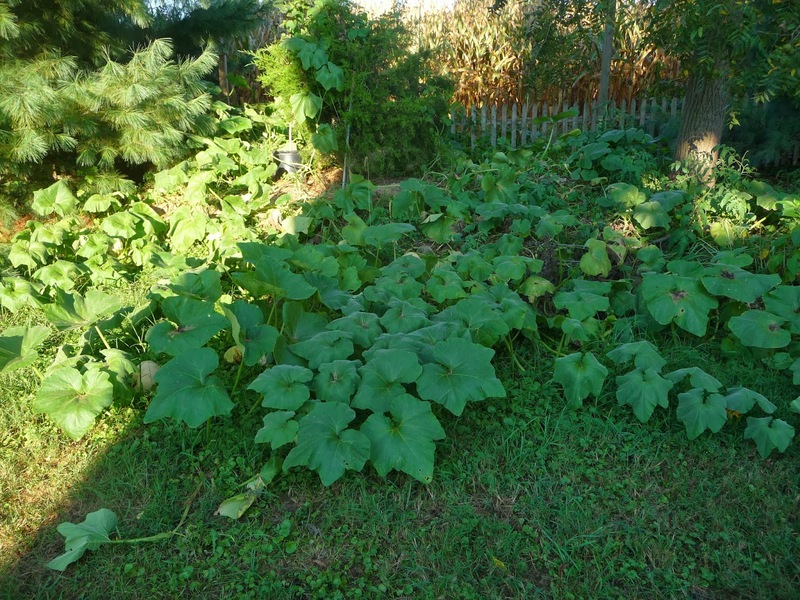 Why is it that it's always that the compost pile that grows the best squash? Must be all of the organic material and moisture. Lucky you Nancy. All those nutrients sequestered from the garden back together in one place has got to be the deal. And a little bottom heat — thanks to the concentration of them — never hurts. What's surprising to me is that squash normally need so much sun, but these guys all grew in a spot that I think of as shady — maybe 4 hours of direct sunlight a day until the corn grew up and shaded them even more.